Editor’s Notes: Following the recent publication of historical photos taken by “Papa Jaan” in Hunza and Uganda during the early 1960’s, we are pleased to publish an important collection of photographs of His Highness the Aga Khan, Mawlana Hazar Imam, taken by Azhar Chaudhry during his tenure as chief photographer of Kenya’s Daily Nation Newspaper. We are thankful to Montreal’s Sultan Jessa, who also worked as a journalist for the Daily Nation, for making this collection available for publication on Simerg’s photo blog with the gracious and kind permission of Azhar Chaudhry. 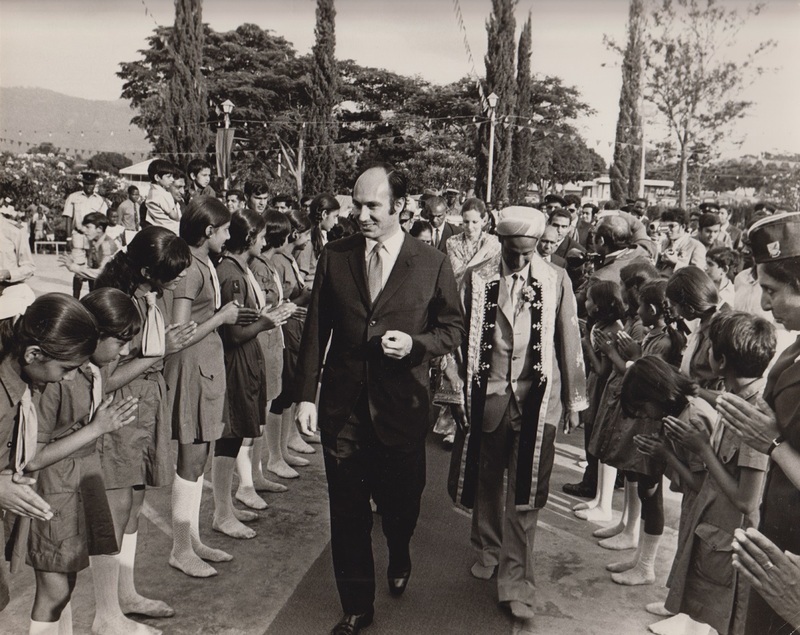 In addition, Mr. Sultan Jessa has also provided photos of His Highness the Aga Khan’s visit to Tanzania in 1966 from his own personal collection. The photos appear after Mr. Chaudhry’s photographs. Daily Nation chief photographer Azhar Chaudhry looks on as His Highness the Aga Khan signs a copy of a special souvenir publication entitled “Smiling Safari” that he produced on behalf of the newspaper to commemorate the 49th Ismaili Imam’s visit to East Africa in the early 1970’s. Photo: Azhar Chaudhry Collection. Copyright. A Note on Captions: Many of the captions are incomplete or may need revisions, and we invite readers who are familiar with details of Mawlana Hazar Imam’s visits to Kenya and Tanzania to submit specific dates and places where the photos were taken, as well as name the individuals we have not been able to identify. Your contribution will ensure that the captions accurately reflect the visits made by Mawlana Hazar Imam to East Africa and other countries. Please send the details to simerg@aol.com or submit them through the comments box at the end of this post. 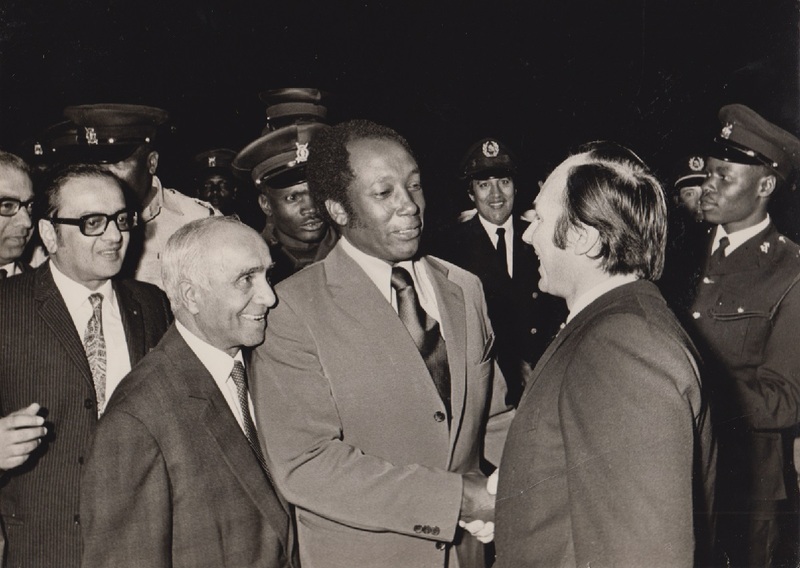 Mawlana Hazar Imam, His Highness the Aga Khan, is greeted upon arrival at the Nairobi Embakasi airport by Kenya’s cabinet minister, Dr. Njoroge Mungai (1926-2014), as Diwan Sir Eboo Pirbhai (1905-1990) looks on. 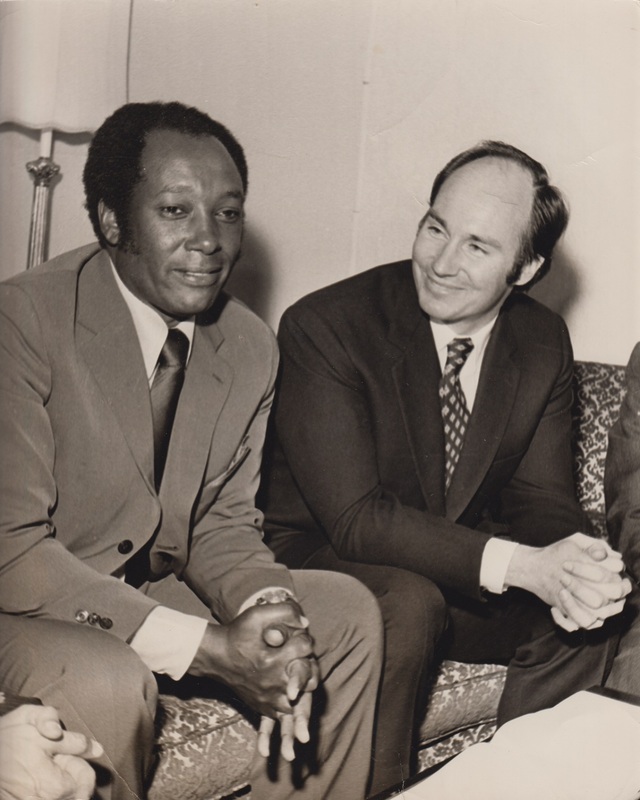 Dr. Mungai served in numerous Ministerial positions and gained fame as an astute diplomat during his tenure as Kenya’s Minister of Foreign Affair. Diwan Eboo was one of the longest serving leaders in the Ismaili community during the 20th century. Photo: Azhar Chaudhry. Copyright. His Highness the Aga Khan and Foreign Minister Dr. Njoroge Mungai, share a light moment at a press conference held at the VIP lounge at Nairobi’s Embakasi Airport. Photo: Azhar Chaudhry. Copyright. 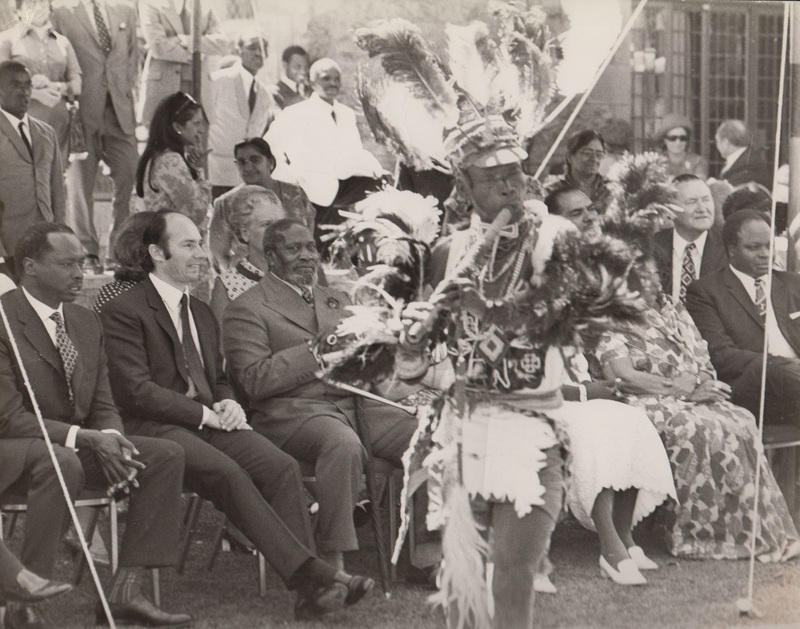 (From left) Kenyan Vice President Daniel Arap Moi, His Highness the Aga Khan, Kenyan President Jomo Kenyatta and Mwai Kibaki (extreme right), watch a traditional African dance at the Presidential residence during the 49th Ismaili Imam’s visit to Kenya. Photo: Azhar Chaudhry. Copyright. 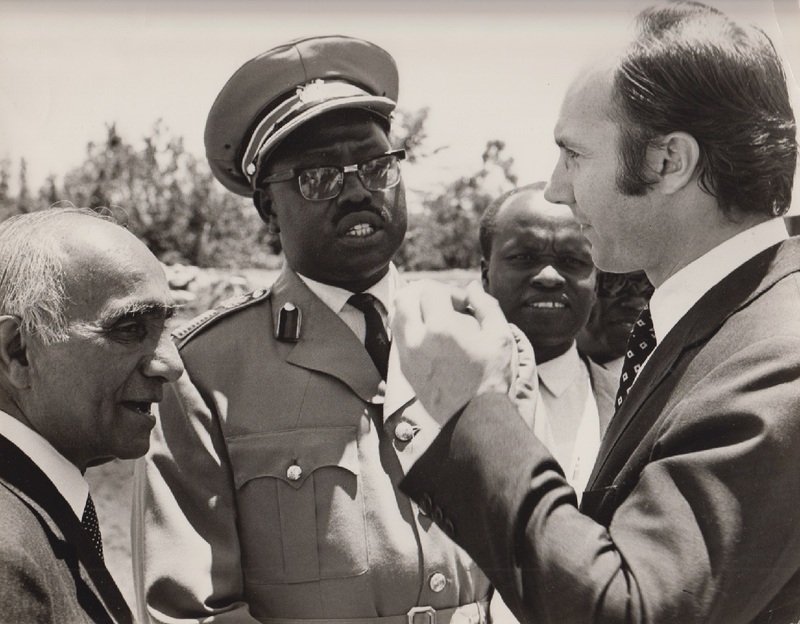 His Highness the Aga Khan in conversation with Kenyan leaders. Photo: Photo: Azhar Chaudhry. Copyright. 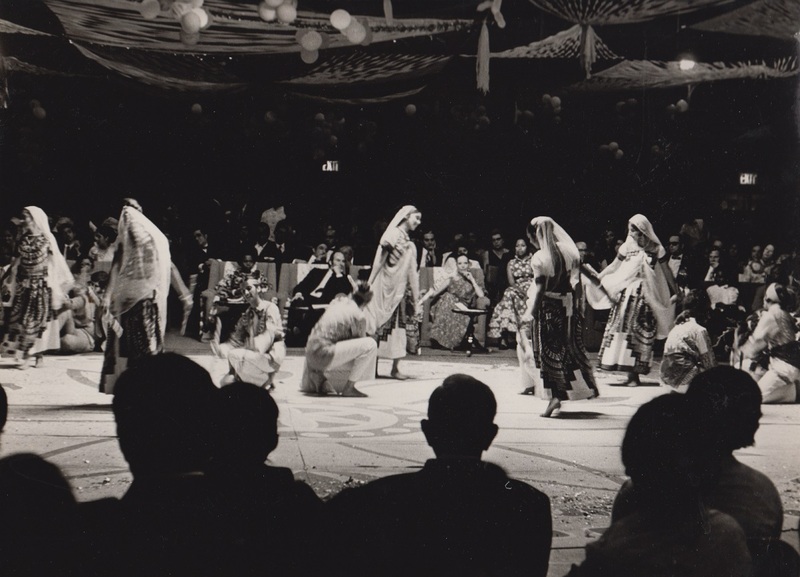 His Highness the Aga Khan and Begum Salimah Aga Khan watch a cultural performance during their visit to Kenya. Photo: Azhar Chaudhry. Copyright. 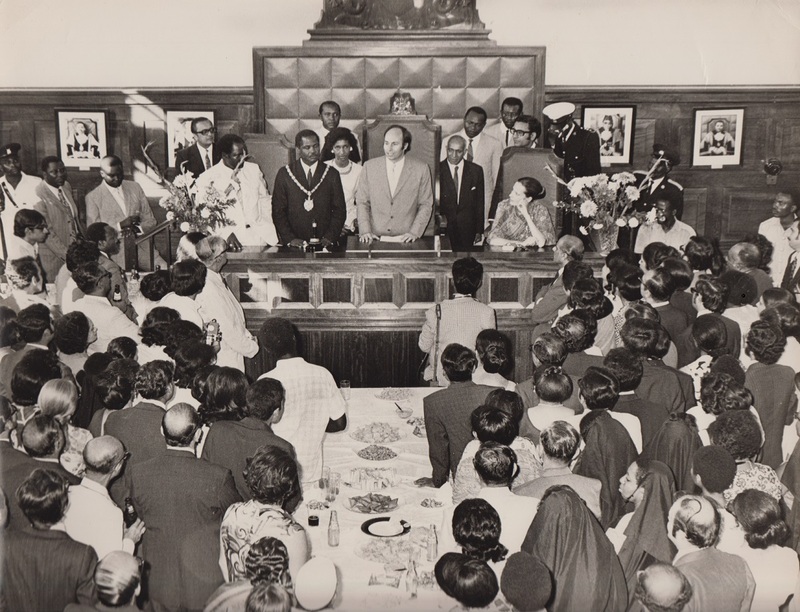 His Highness the Aga Khan seen making remarks during a reception held by a Kenyan Mayor, with Begum Salimah looking on. Photo: Azhar Chaudhry. Copyright. 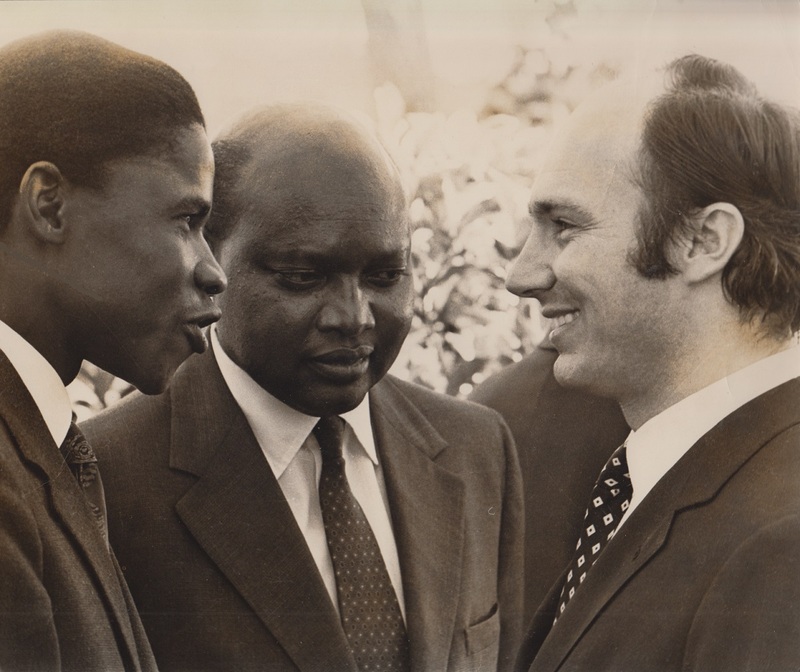 His Highness the Aga Khan conversing with an official and Diwan Eboo Pirbhai during his visit to Kenya. Photo: Azhar Chaudhry. Copyright. 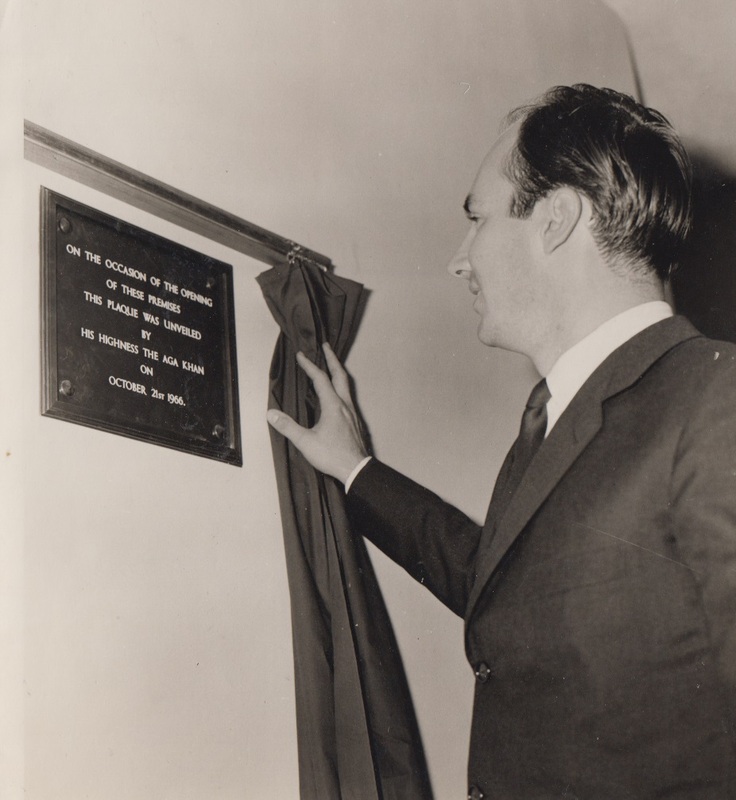 His Highness the Aga Khan unveils a plaque during a visit to Kenya. Photo: Azhar Chaudhry. Copyright. 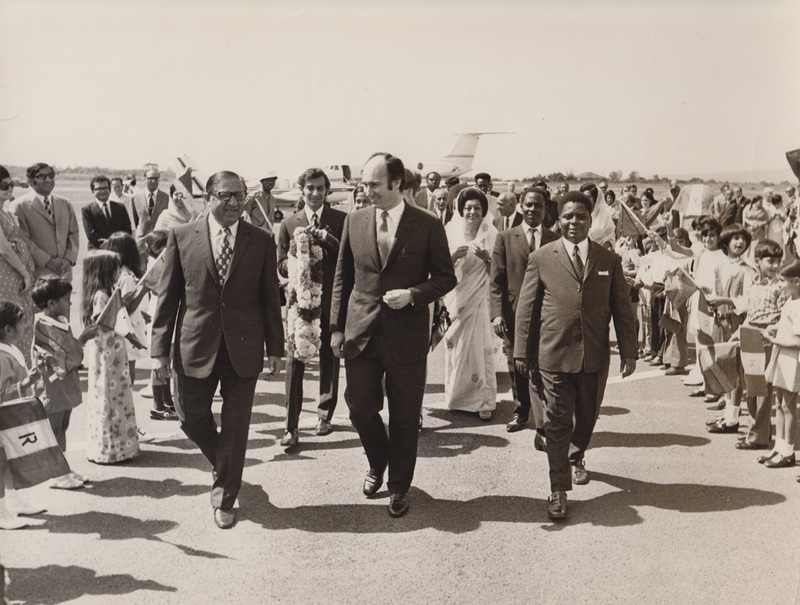 His Highness the Aga Khan arrives to a warm reception at a Kenyan city. Photo: Azhar Chaudhry. Copyright. 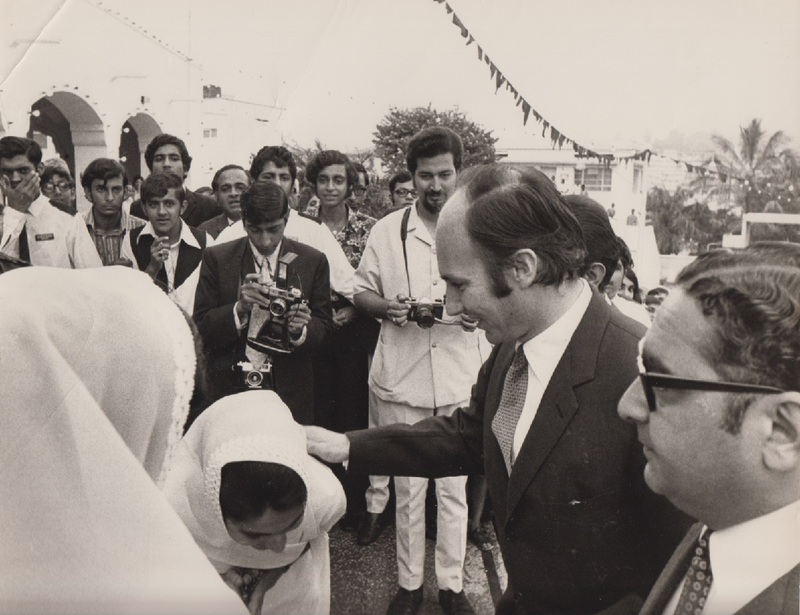 An Ismaili leader respectfully presents herself to His Highness the Aga Khan as he arrives at a jamatkhana during his visit to Kenya. Photo: Azhar Chaudhry. Copyright. His Highness the Aga Khan is greeted by Mr. Michael Curtis during his visit to Kenya. Photo: Azhar Chaudhry. Copyright. 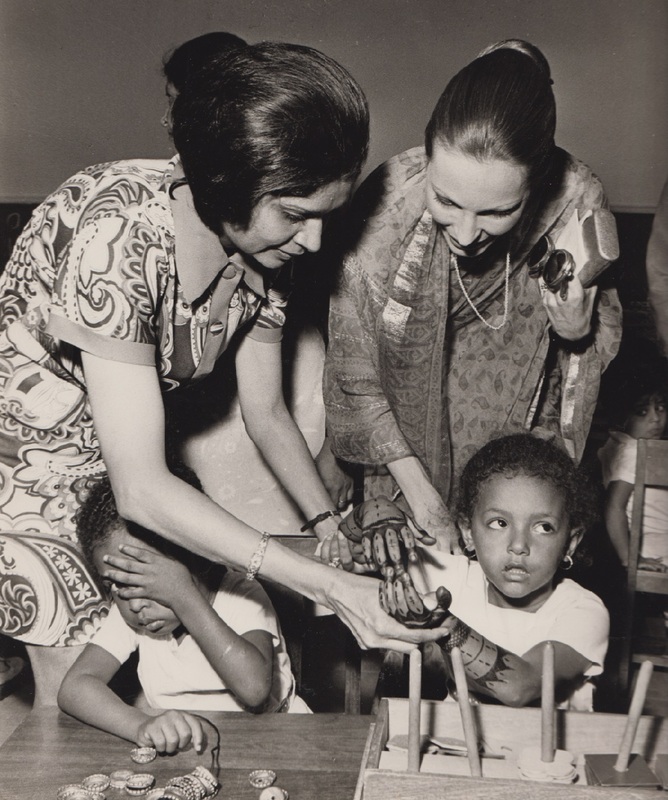 A young girl shies away from the cameras, as her classmate presents her freshly clad henna hands to the photographers during a school visit by Begum Salimah Aga Khan. Photo: Azhar Chaudhry. Copyright. 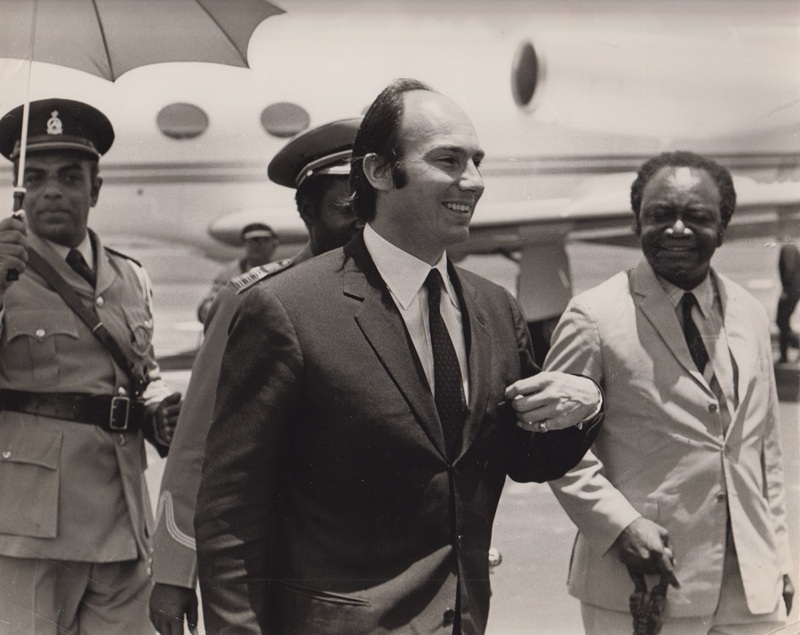 His Highness the Aga Khan is welcomed by Kenyan Cabinet Minister, Ronald Ngala, during his arrival at a Kenyan city. Photo: Azhar Chaudhry. Copyright. Ismaili youth respectfully lineup to receive their beloved 49th Imam, His Highness the Aga Khan, as he arrives to give an audience to his followers at a Kenyan jamatkhana. Photo: Azhar Chaudhry. Copyright. 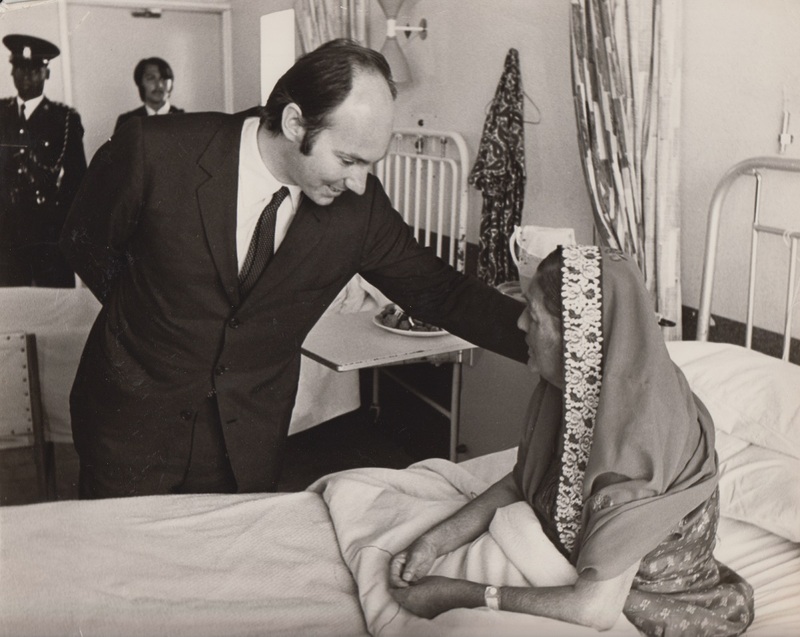 His Highness the Aga Khan visits a patient at Nairobi’s Aga Khan Platinum Jubilee Hospital during his visit to Kenya. Photo: Azhar Chaudhry. Copyright. 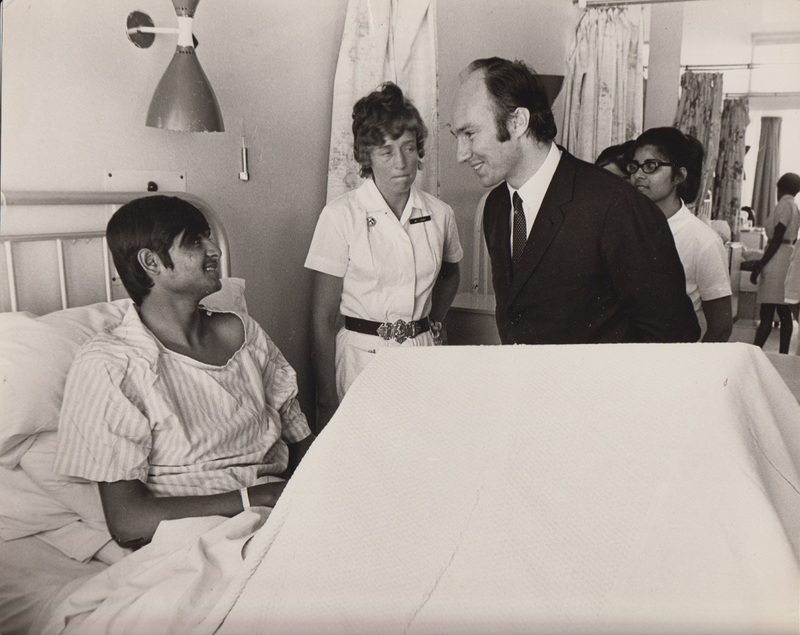 His Highness the Aga Khan visits a young patient at the Nairobi Aga Khan Platinum Jubilee Hospital during his visit to Kenya. Photo: Azhar Chaudhry. Copyright. 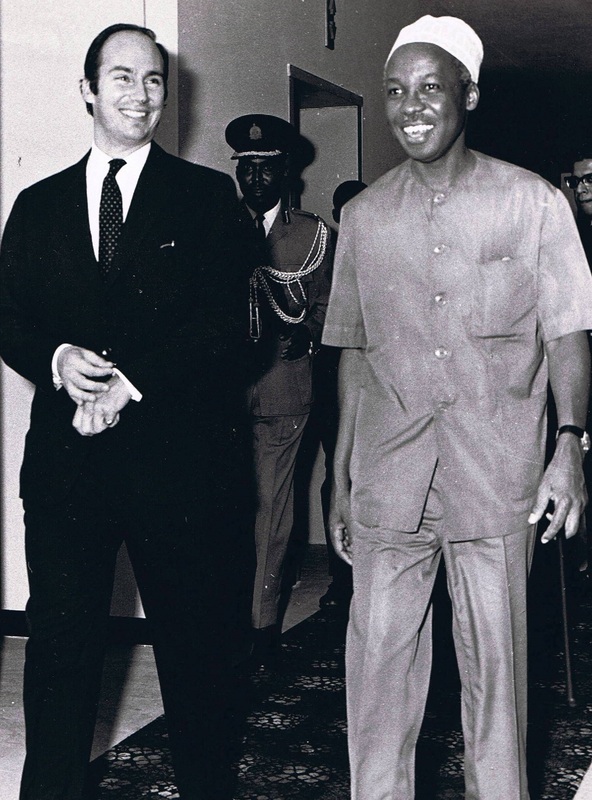 His Highness the Aga Khan with Tanzania’s President Julius Nyerere during his visit to the country. Photo: Sultan Jessa Collection. 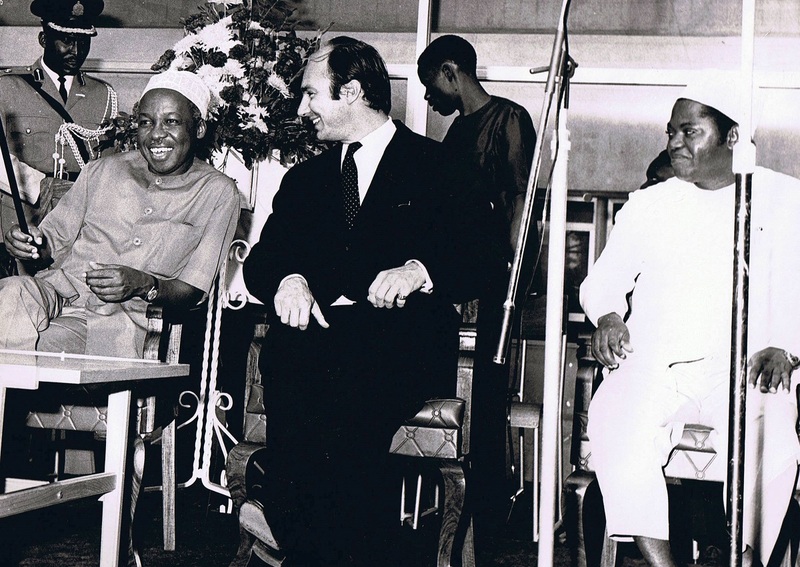 His Highness the Aga Khan and Tanzanian President Julius Nyerere (1922-1999) share a light moment as Vice President Rashidi Kawawa (1926-2009) looks on during the 49th Ismaili Imam’s visit to Tanzania. Photo: Sultan Jessa Collection. 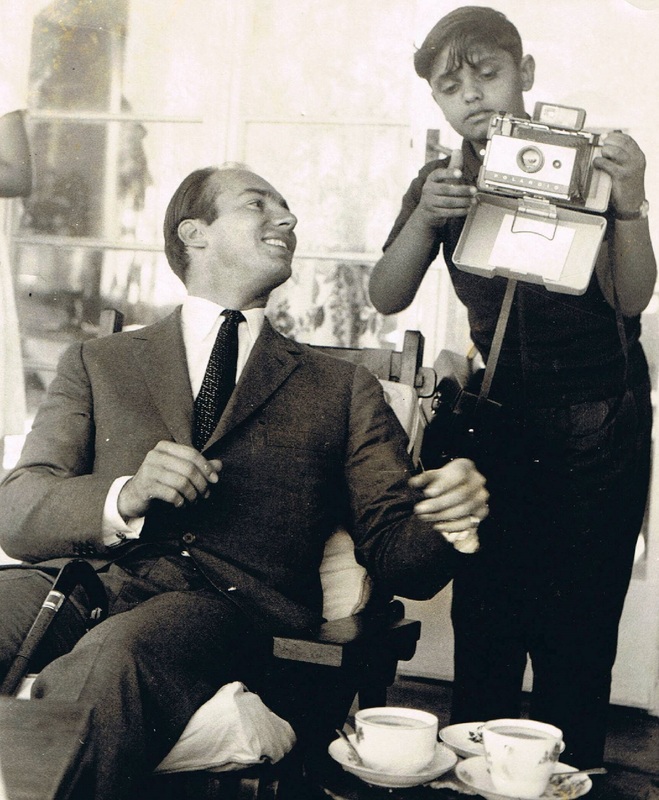 His Highness the Aga Khan and aspiring young photographer, Alnoor Abdulla Premji Kanji, now a resident of Toronto, await the printout of a photograph taken with Alnoor’s polaroid instant camera during the 49th Ismaili Imam’s visit to Mtwara, Tanzania, in 1966. Photo: Sultan Jessa Collection. 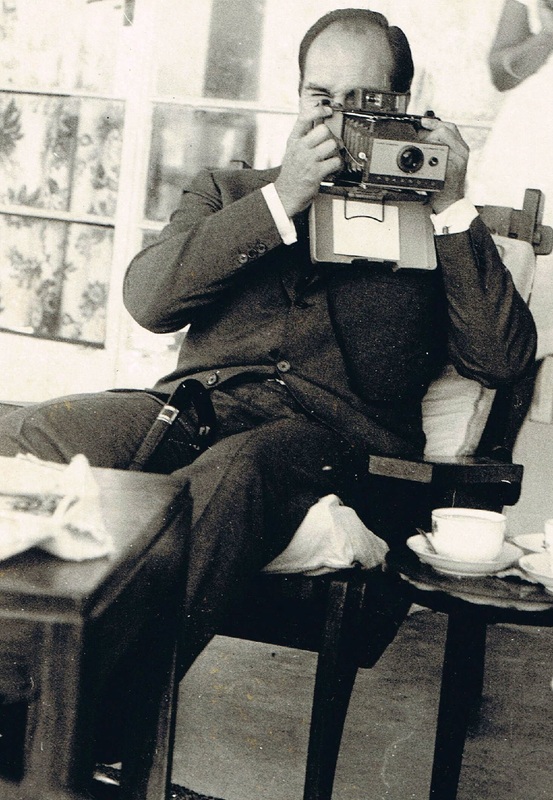 His Highness the Aga Khan tries out the polaroid camera during his stay in Mtwara, Tanzania, as part of his extensive visit to East Africa in 1966. Photo: Sultan Jessa Collection. Date posted: February 17, 2016. Last updated: December 29, 2016 (caption update: we have learnt that the aspiring photographer who took the photograph with a polariod camera was Alnoor Kanji, currently in Toronto. It was taken in Mtwara, Tanzania, in 1966). For a profile of Azhar Chaudhry, please click Contributors. Readers are invited to submit their feedback below. We also invite you to visit our literary blog http://www.simerg.com. Excellent memories of our past in Dar es Salaam. It reminds me of my young age when I used to serve the jamat at Upanga Jamat Khana as volunteer when my dad was Mukhi (Alijha Adulkarim Karmali Mohamed with Kamadia Abdul Fazal Kassam). The photo before where Mr. Cutis is shown is that of Uganda. The Mukhi, Mr. Lakhani, is at left of Mawlana Hazar Imam. The arches are trademark Kampala jamatkhana. The year should be 1972, when Mr. Lakhani was Mukhi. It’s “down memory lane” with a mosaic of these memorable photographs. Thanks for such a beautiful collection. Must have been a tedious task. Congratulations to all team members. 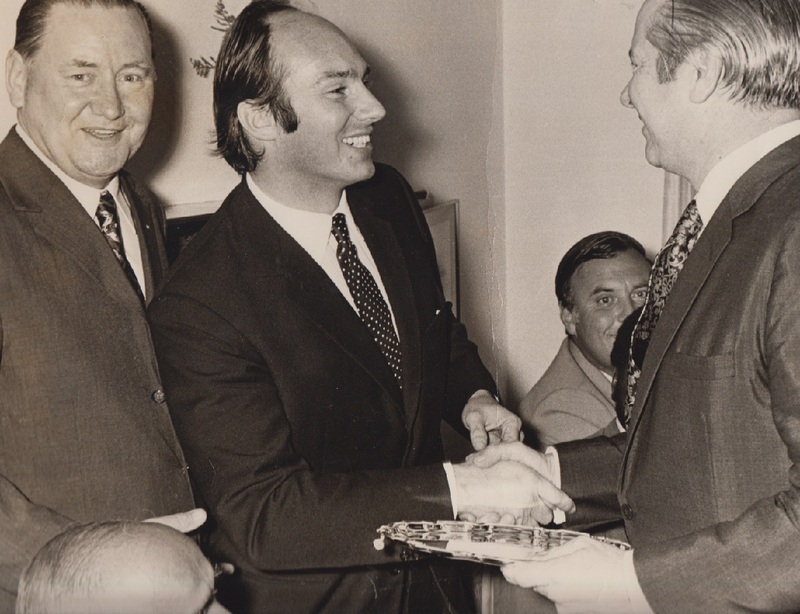 Thanks for sharing these wonderful photos of His Highness the Aga Khan which very few of us have seen.